2018 was a reminder that volatility is part of investing. In recent years we’ve been spoiled by generally nice stock market growth with moderate to low volatility. Volatility returned in 2018 and accelerated in Q4. While many headlines can make this sound alarming, it is normal. In order to capture the long-term benefit of the market we must be willing to deal with the volatility that comes with it. A comparison of 2017 and 2018 illustrates how much things can change and how unpredictable short-term market characteristics can be. Below are graphs showing the performance of the MSCI Global Stock Market Index for 2017 and 2018. Note the relatively smooth growth of 2017 compared to the choppy losses of 2018. 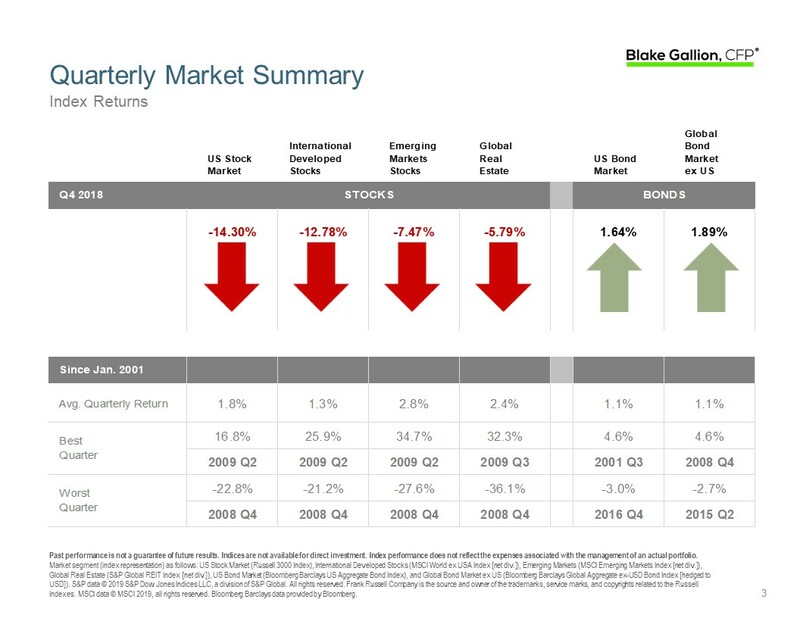 In Q4 the US, international, emerging and real estate stocks all had negative returns. The same is true for the entire year of 2018. Bonds in the US and globally were positive in Q4, bringing returns for the year just into positive territory domestically, with better yearly performance by global bonds. For a detailed market overview covering Q4 and all of 2018, click here.